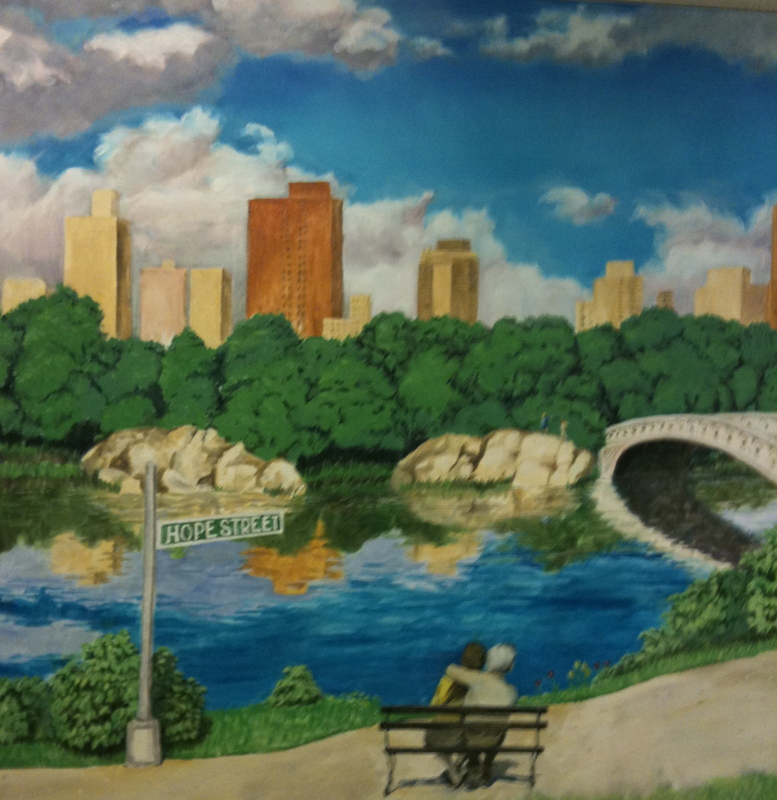 A painting from Hope Lodge, NYC, taken during a tour with our ACS BAC group, which included Susan. 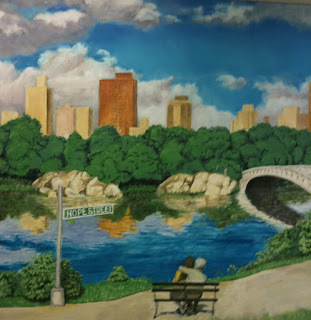 A painting we admired. When you are grieving, I told my friend Devra as we talked last night---the last day of our friend Susan's life--when you are grieving, I think you are insane, a little. Devra explained to me that in Judaism the literal translation for grief is "out of your mind," and you must give space to grievers to be out of their minds. In the face of loss, people deserve space to be out of their minds. And they will get back in their minds in their own time, not when people are tired of their grief and ready for them to move on. We are unfair to grief, I think, treating it as an enemy or a disease to be fought. We do not succumb to grief. We do not lose to grief. We engage grief. It gives us the time our hearts need for us to be out of our minds. Right now I am a little out of my mind. A lovely, amazing, inspirational woman is finished. Her body stopped. I mourn. Oh all the wonderfulness of her, all she was and did in so little time. How much more might she have…but, it is a design, I have faith. Thank you, God, for the time of Susan that we had. Cold comfort. Because we mourn. We grieve. We are out of our minds. Thank you grief, for the space to admit the blessing of a person, and the pain of her loss; for the time to know who she was and what she meant to us; for the loss of sanity when we mourn out loud so the world knows the new hole in our sky, the tear in our hearts. The stars are not wanted now: put out every one. And then, one day, our minds will return to us, when our heart retreats, our grief recedes. One day we will know the miracle it has been, the life, and that is the part we’ll think of most of all. Oh what better thing to finish with for Susan--bright star always, lady of planetary science, answerer of why, belly laugher, sensitive understanding heart, tremendous warrior advocate, bringer of greater good, feet on the ground, 200 watt mind--than another beautiful quote about still being there just because we knew her. Many blessings to Susan’s family. And wishes to you for all that you need during this time. more tears. . .i never met her "in real life" but like so many i knew er on-line for many years. she IS a star now in the heavens among the bright, full, february snow moon. Wow. Such a fitting tribute. Julie, this is so lovely, thank you for sharing. I lost my best friend in a boating accident a little over a year ago and since that day, I have never felt more alone in the world. I have turned to friends for help as well as sites like http://onlineceucredit.com/edu/social-work-ceus-dl to get me through this difficult time. I encourage you to take a look and let me know what you think. oh yes. lovely, J. so sad and beautiful.